Mr. Chairman, by profession, I am a behavioral scientist. My field of specialization is human development, in particular the processes through which the newborn infant is gradually transformed into an effective member of society...There is a growing body of scientific evidence that the process of making human beings human is breaking down in American society. The signs of this breakdown are seen in the growing rates of alienation, apathy, rebellion, delinquency, and violence we have observed in youth in this nation in recent decades. And the indications from the evidence are that these trends will be continuing at an increasing rate. The causes of this breakdown are, of course, manifold, but they all converge in their disruptive impact on the one institution that bears primary responsibility for socialization in our society—the American family. Russian-born Urie Bronfenbrenner was the intellectual giant who shaped much of modern thought on the process through which a baby travels the life course, from infancy, childhood, and adolescence, through the rites of passage that define entry into and through adulthood. While he is most known as one of the founders of HeadStart, Bronfenbrenner's groundbreaking "bioecological" theory established that human development unfolds in a nested set of concentric systems that can either assist humans to flourish or pervert their social behavior. 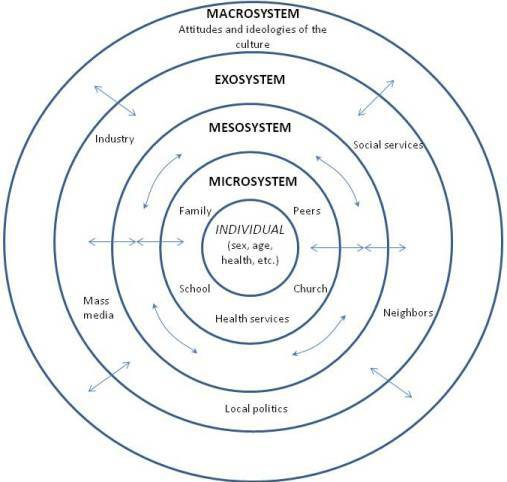 With the child and his or her unique genetic and personality traits at the center, Bronfenbrenner’s environment includes the microsystem, the mesosystem, the exosystem, and the macrosystem. Most influential, the microsystem is the immediate environment in which the child lives and maintains deeply personal connections with parents, siblings, and care-giving relatives that typically comprise the nuclear family. The quality and stability of these relationships in the microsystem then determines the child’s level of influence—or vice versa—over all the other layers of the ecosystem. As education reformers grapple to understand why our country's academic outcomes have been so poor for so long for so many—after spending hundreds of billions of dollars and despite the heartfelt commitment of exceptionally talented people—Bronfenbrenner’s human development framework provides a critical clue as to why some children predictably fail and why others more reliably succeed. Those of us who have worked for decades in low-income communities know the suffering of kids—and the long-lasting negative effects—if they come of age in a fractured microsystem. The legendary 30 Million-Word Gap research documents the daunting vocabulary deficits that arise when a child grows up in a home that lacks quality verbal interaction and formal language with parents. Moreover, the anti-social behaviors some children exhibit upon entry into pre-kindergarten or kindergarten are likely a direct result of having been raised in a chaotic family environment. Yet as one who runs a network of public charter schools in low-income communities in the Lower East Side of Manhattan and the South Bronx, I know that these tragic stereotypes are not inevitable. There are countless examples of joyful, well-adjusted children in strong families beating a path out of poverty. These children emerge from stable home environments ready to learn, despite negative factors in the outer macrosystem that could derail other children. The question is what makes the difference. In “The Impact of Family Formation Change on the Cognitive, Social, and Emotional Well-Being of the Next Generation,” sociologist Paul R. Amato captures the decimating impact of what he calls "perhaps the most profound change in the American family over the past four decades." Using data from the National Study of Adolescent Health, the largest and most comprehensive longitudinal survey of adolescents ever undertaken, Amato estimates that more than 1.2 million fewer children would have been suspended from school and nearly 750,000 fewer youngsters would have repeated a grade in 2002, if the share of two parent households in America had held at their levels before the explosion in out-of-wedlock births rose higher in the 1960s. That would have been about a million fewer children in 2002 placed on the school-to-prison pipeline then, and many fewer adults jailed today. Indeed, when education reformers decry the criminalization of youth, their concern is typically the disproportionate number of suspended Latino and Black students, which is then later reflected in disproportionate rates of incarceration. The usual assertions of causality range from excessively punitive disciplinary policies, to implicit bias of teachers or systemic racial discrimination. Yet Bronfenbrenner’s framework and Amato’s analysis, taken together, suggest that perhaps there is a force more fundamental to human development than racism or behavioral policy interventions. Because discrepancies in education outcomes like suspensions are normally reported by race, it is easy to assume that they are caused solely or largely by racism. However, while race is a factor, these gaps are likely more related to the gaps in family structure and stability within which a child is raised. These data help to explain why the juggernaut growth of out-of-wedlock births, especially to young women aged twenty-four and under, has had such devastating consequences for children of all races. To get a sense of the disadvantage the next generation will face, consider that the CDC recently released its nationwide Final Birth Data for 2015. It is beyond depressing to forecast the likely consequences for the more than 300,000 white babies born to unmarried women aged ten to twenty-four, as well as the more than ninety percent of the black babies born out of wedlock to women aged ten to twenty-four. The rise in the number of homes without resident, married fathers has created a whole new category of fragile families that is now the primary factor driving the “intergenerational transmission of disadvantage” from parent to child. To prepare for this new wave of fragile families in NYC, at Public Prep—the five-school charter network of which I am the CEO—we are considering an innovative partnership that would empower parents of our current students to receive a thirty-minute home visit twice per week for forty-six weeks. Over two years, these at-risk parents (typically single mothers, teen parents, or grandparents raising grandchildren), would volunteer to receive a visit from a learning specialist who would help build their ability to improve the early literacy and numeracy skills of their toddlers (sixteen months to three years old). Our hope is that this partnership could be transformative for our families, especially given the opportunity to have much younger siblings of current Public Prep scholars achieve much higher levels of vocabulary acquisition and school readiness before they enter our PrePrep (UPK) program. While this preventive measure could show some promise to help at-risk parents and their very young children, this cannot be a permanent solution. The education reform community has a crucial role to play in preventing the creation of fragile families in the first place. Yet the explosion in out-of-wedlock births, especially to unmarried women aged ten to twenty-four, is rarely even mentioned by education reformers as a central issue impeding academic outcomes. Nor is addressing it identified as a crucial strategy necessary to transform educational outcomes for children. Indeed, in January 2017, a who’s who of some two-dozen leaders in education reform gathered to discuss the intersection between race, social justice, and education reform at a roundtable hosted by American Enterprise Institute and New Schools Venture Fund. The summary statement of the discussion is a must-read for multiple reasons, the top line of which is that it highlights the emerging factions within the education reform community and the risk that today’s shaky coalitions will weaken further due to disagreements on the role education reform should play to break the intergenerational cycle of poverty. For me, what’s most mind-boggling about the statement and the related panel discussions are that they make zero mention of the skyrocketing growth in non-marital births across races, and the terrible impact of that growth on educational outcomes. We know better. Indeed, the magnitude of the issue and the fact that it cuts across race could be an important basis on which education reformers might make common cause. This is especially important now because the social and civic institutions through which children historically learned about the optimal timing of family formation and the rites of passage into adulthood have themselves weakened. Reductions in religiosity, the declining trust of political leaders, and an increasingly nihilistic popular culture—all combine to create cracks in every layer of Bronfenbrener’s ecosystem. The education reform community has a unique responsibility as keepers of perhaps the remaining civic institution—public schools—that interacts with almost every child for prolonged periods almost every week (or at least the thirty-six weeks of the school year). That is why two-generation solutions such as a parent-home-visiting program or the Success Sequence should be explored as part of a core curriculum, given the data that show it’s nearly impossible for a poor person to remain poor if that person makes a series of life choices—finish high school, secure a job, and get married before having a child, in that order. Indeed, if the education reform community does not explicitly address the issue of proper family formation, we will repeat the horror movie now playing in Chicago, where the erosion of stable families is driving many who care deeply about children to try to devise late-intervention solutions. Consider two different approaches being tried in Chicago. In the first, former Secretary of Education Arne Duncan is seeking to address the grisly reality that someone has been shot every other hour in the Windy City over the past year, pushing murders to their highest point in nearly two decades. During the time Duncan was CEO of Chicago Public Schools, from 2001 to 2008, on average, a student was shot to death off campus every two weeks. Experiencing this carnage no doubt indelibly influenced Duncan, who recently said: “If we want to stop the shooting, we have to work with the shooters.” As a result, Duncan has founded Chicago CRED (Create Real Economic Destiny), a non-profit that “operates on a core belief that jobs can stop bullets.” The goal is to provide employment to men between the ages of fifteen and twenty-four years old, many of whom lack high school diplomas and are victims and perpetrators of gun violence. But these shooters, AKA human beings, weren't born with guns in their hands, or with the predisposition to kill other human beings. The question is whether there are earlier, leading indicators that would prevent all of this educational failure and bloodshed in the first place. Let’s look back seventeen years ago in Chicago, when many of the young people caught up in today’s violence, were born. According to the epidemiology unit of the Cook County Department of Public Health, which emcompasses Chicago, 62 percent of the more than 8,700 babies born to women of all races aged twenty-four and under in 2000 were born out of wedlock. Of the more than 2,500 black babies born in 2000 to women aged twenty-four and under, a staggering 89 percent were to mothers who were unmarried at time of delivery. Even more disturbing, 42 percent of black mothers aged twenty-four and under fell in the official category of “missing information for father,” far higher than any other racial category. Given the overwhelming data detailing the adverse impact on boys and girls growing up without a father, this could help explain the rise in out-of-wedlock births and the epidemic of gun violence in Chicago. Nearly fifty years ago, like James Coleman and Daniel Patrick Moynihan before him, Urie Bronfenbrenner sounded the alarm that our society’s central organizing unit—the stable two-parent family—was in alarming decline. Left uninterrupted, the pathologies created by that disintegration, already so evident in certain communities in the late 1960s, would accelerate and become their own independent destructive force across all communities. Today, we live amid irrefutable evidence that children raised in stable, married, two-parent households (regardless of gender) have, on average, far superior life outcomes, not only in education but also in virtually every other category of healthy human development. Educators cannot control the structure of the families into which our current students are born. But we can influence how our students think about the family structures they form and the series of life choices that will likely lead to their life success and that of their children. Perhaps then we can achieve the intergenerational transmission of advantage. To make human beings human, we must accept the responsibility to empower our young scholars with this information. If not us, who will?